The 15th Annual Civil War Preservation Ball was held in the rotunda of the Pennsylvania Capitol Building in Harrisburg on Saturday, March 10. The ball raises money for the Pennsylvania Gettysburg Monuments Project which provides funds for the repair and maintenance of monuments at Gettysburg National Military Park. This year’s ball brought the total raised in fifteen years to over $100,000! Dance instruction for the ball was provided by the Civil War Dance Foundation and music was played by the Philadelphia Brigade Band. Larry Keener-Farley, Rebecca Kesler, and Gary Peyre-Ferry served as dance masters. Special thanks to the event sponsors for supporting preservation: PNC Bank, Gmerek Government Relations, Inc., Columbia Gas of Pennsylvania, Malady & Wooten LLP, Pennsylvania American Water, Cranmer Associates, Pennsylvania Chamber of Business & Industry, Roaring Spring Water, and Giant Foods. Next year’s ball will be held on March 30, 2019. Email PreservationBall@CivilWarDance.org to be placed on mailing list. 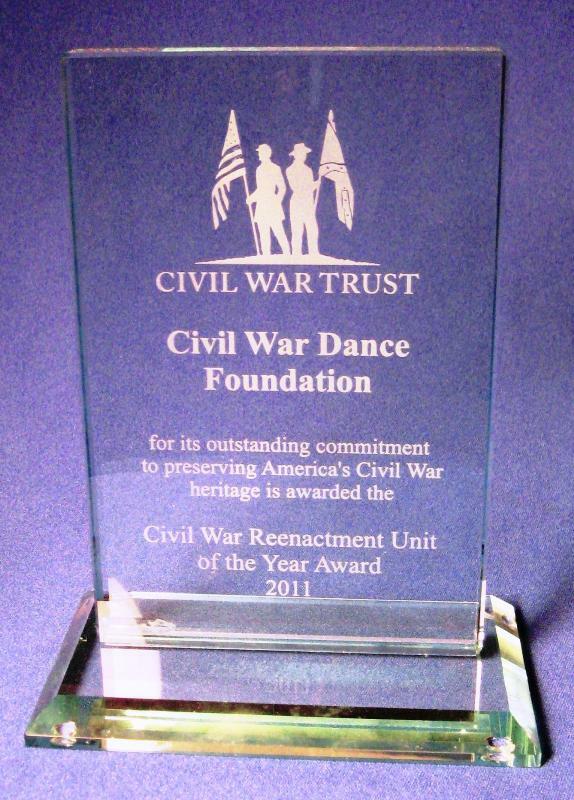 The Civil War Dance Foundation was named the Civil War Trust’s 2011 Reenactment Unit of the Year. This is the first time the award was presented to a civilian living history organization. The award is one of several presented by the Civil War Trust to individuals and groups in recognition of their outstanding commitment to preserving America’s Civil War heritage. “We are deeply honored by this award and hope that our work will inspire others to support historic preservation,” said Annette Keener-Farley, President of the CWDF. 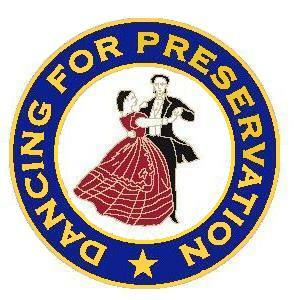 Since 2000, the Civil War Dance Foundation has donated over $57,000 from its own treasury to Civil War preservation and education projects, including $6,500 to the Civil War Trust. It has also presented educational programs at the CWT’s Teacher Institute and provided entertainment at the CWT’s Annual Conferences. In addition, the Civil War Dance Foundation has helped to raise over $260,000 for various Civil War preservation projects, historic sites and museums. Its two biggest annual events support preservation at the Gettysburg Battlefield. 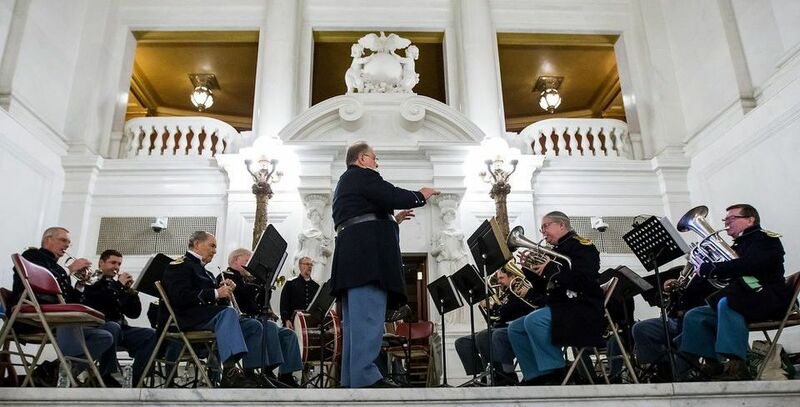 Since 2004, it has conducted the Civil War Preservation Ball in the rotunda of the Pennsylvania Capitol Building in Harrisburg, Pa., and raised over $100,000 for the Gettysburg Monuments Endowment Trust Fund. Since 2005, the National Civil War Ball on Remembrance Day in Gettysburg, Pa., has raised over $50,000 for Gettysburg National Military Park. 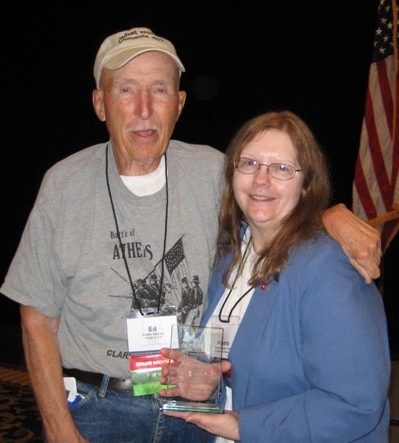 CWDF President Annette Keener-Farley was congratulated by Ed Bearss at the Civil War Trust’s Annual Conference in Chantilly, Virginia. Always a good sport in the cause of preservation, Ed has danced with the Victorian Dance Ensemble during an audience participation dance at the Landon House, site of General J.E.B. Stuart’s “Sabers and Roses Ball” in 1862. The Victorian Dance Ensemble, the performing troupe of the Civil War Dance Foundation, received the President’s Volunteer Service Gold Award from President Barack Obama for donating more than three thousand hours of volunteer public service during 2016. 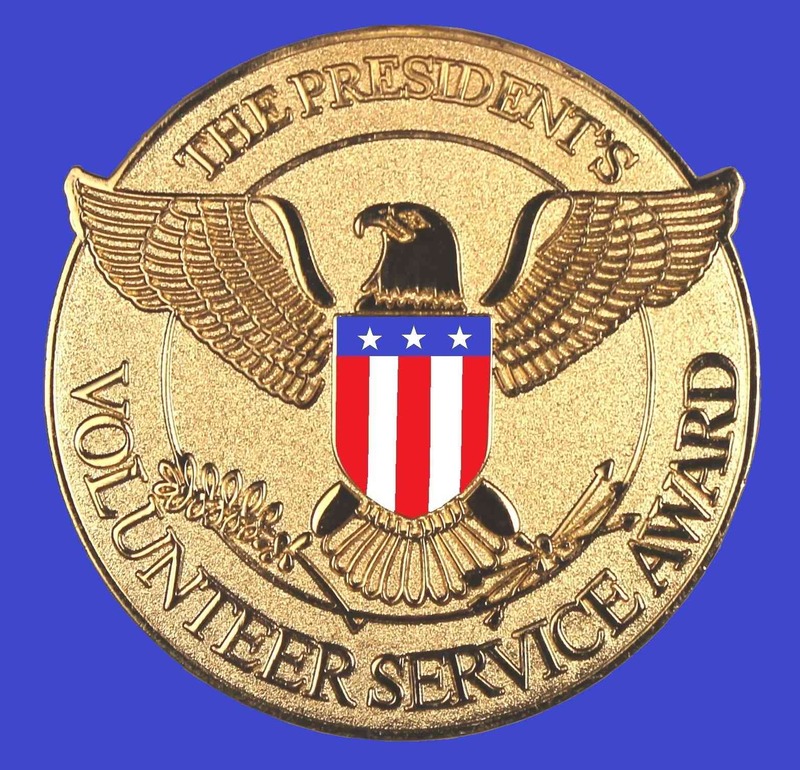 The President's Volunteer Service Award program was created by President George W. Bush to encourage and reward volunteer service. It is administered by the Corporation for National and Community Service, a federal agency. The awards recognize individuals and groups that have achieved a certain number of hours of volunteer service during a 12-month period. Bronze, silver, and gold level awards are presented, honoring various amounts of total hours. One thousand hours are required for the gold group award and the VDE accumulated more than three times the number of hours needed for the gold level honor. The VDE conducts balls, dance demonstrations, dance classes, artifact displays and living history programs for the National Park Service, museums, historical societies, historic sites, schools and senior facilities. Twenty-seven organizations benefited from the VDE’s volunteer service in 2016. The Gettysburg National Military Park benefitted the most, with 875 hours of service, more than one-fourth of the dancers’ 3,480 total hours. The primary purpose of the VDE is to raise money for historic preservation and education projects, and to promote visitation to historic sites. Since 2001, the VDE has helped to raise over $260,000 for over fifty projects, and its programs have attracted thousands of visitors to historic sites. The 30th Annual National Civil War Ball, the original and official ball of Remembrance Day in Gettysburg, was held at the Eisenhower Hotel on Saturday, November 17, 2018. Guests from across the country danced the night away to the music of the Philadelphia Brigade Band. The dance instruction was led by Larry Keener-Farley, Rebecca Kesler, and Gary Peyre-Ferry. Among the guests was an old friend, Phil Troll, the original dance master of the ball. Over the years, this ball has raised more than $85,000 for preservation work at Gettysburg National Military Park. Philip Troll, the original dance master of the ball, returned for the thirtieth anniversary of the ball and danced with VDE member Rebecca Kesler. VDE President Annette Keener-Farley dancing with David Klinepeter, a 75 year member of the Sons of Union Veterans. Dancers came from Pennsylvania, Delaware, Maryland, New Jersey, New York, Tennessee and Virginia to "dance for preservation." This ball is the nation’s most elegant Civil War event. The rotunda of the Capitol Building provides a spectacular setting for an 1860s ball. The architecture and artwork provide a fitting background for the dancers, with ladies in hoop dresses and gentlemen in formal attire or military uniforms.